The Panasonic CS-894 steam microwave has so many more features than a conventional microwave. It really does speed up the cooking process even with dishes that you might normally expect to need hours in the oven. This year, Spring seems to be rather late, so I’m craving comfort food. Dishes like Gratin Dauphinois usually need long, slow cooking, but with the Panasonic CS-894 you can get a great result in a much shorter time. With this recipe, I wanted to investigate the combination features of the fantastic Panasonic CS-894 steam microwave. It allows you to mix and match the four cooking methods (steam, microwave, oven and grill) to create the most effective cooking method. Fortunately, it is really simple to do; you just choose the level you want for each function and then put in the time and press go! This recipe adds a touch of luxury to your spuds. It has a terrific flavour, a crunchy top and a classic creamy texture. I have upped the cream quantity from the original recipe but if you want a healthier option you could reduce the amount to 150ml. Rub halves of garlic around the interior of the dish and discard. Place potatoes in dish with 45cm of water. Cover, place on the base of oven and parboil on STEAM 1 and LOW MICROWAVE for 12 minutes. Drain. Slice thinly. Layer the potato slices in the dish, seasoning with salt, pepper and nutmeg between each layer. Pour the cream evenly over the top of the potatoes and dot with butter. Place dish on glass shelf in lower shelf position and cook on CONVECTION 190 degrees C + SIMMER MICROWAVE for 25 minutes or until the potatoes are cooked. 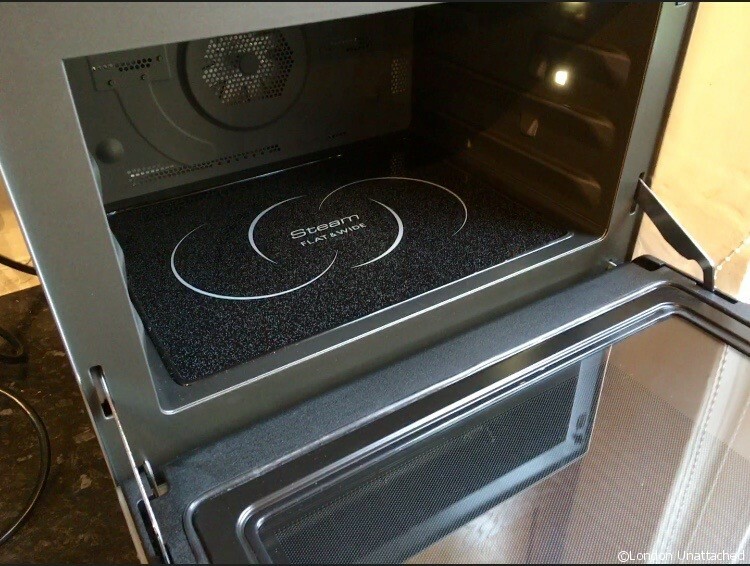 An old favourite with a new angle – the steam microwave . Perhaps something will turn up at Christmas.